1. Thoroughly drain the crab meat using a sieve, then put in a bowl and mash into smaller pieces with a fork. Beat the mashed potato in a separate bowl with half the fennel, half the dill, the chilli powder and a little salt. Stir in the crab meat and divide the mixture into 4, then shape into crabcakes. 2. Using a sharp knife, quarter the salad onions lengthways, then cut across into 5cm lengths. Slice the beetroot as thinly as possible, then cut across into matchsticks. Mix in a bowl with the salad onions, remaining fennel and dill, capers, mustard and 1 tsp oil. 3. Heat the remaining oil in a frying pan and fry the crabcakes for about 2 minutes on each side until pale golden. 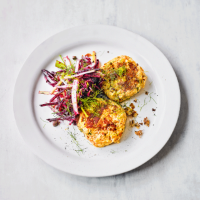 Serve with the beetroot salad. This recipe was first published in Thu Aug 02 11:21:12 BST 2018.